I was wondering why everyone needs gimbals with motors/servos and a electronic circuit. Why don't people just put a weight on the bottom of the camera to make sure it always points up and doesn't flip over? With good axles (or whatever the camera would turn on to keep it level) that don't have a lot of friction I don't see why the system wouldn't work. It would probably be a lot more inexpensive too. I think it might wobble around heaps. If you're moving and stop it would swing back and forward. And it might get blown around a it by prop wash. You might want something to dampen it. As far as vibrations adding weight to the camera is a great idea. That's why I love david's battery tray. It adds the inertia to the camera, making it less affected by vibrations, and since your'e using the battery as the weight it's not much more heavy. I've thought about this before because it would be a lot simpler like you've said. I find there are a number of issues that would make an analog gimbal much less effective than an electronic based gimbal. Like RcPro97 says, it will probably wobble around a lot. The only force working to keep the camera in position is gravity, which is constant. So any movement from the aircraft, fast or slow, is going to result in the same reaction from gravity, which is constant. Electric gimbals have PID loops that account for variations in the movement of the aircraft relative to the gimbal. With a lot of weight an analog gimbal might hold pretty well, but then you are adding a lot of weight to the airframe. Another issue is that you can not deal with yaw with an analog gimbal. Maybe with enough weight you can increase the moment of inertia of the gimbal enough that it does not easily rotate when the aircraft yaws, but then again you are adding a lot of weight. Overall an analog gimbal will not work as well as an electronic one. But it is a concept that I think should at least be attempted to see what happens. If you are not aiming for very clean AP work then maybe an analog gimbal could work. Ok thanks. Just wondering why no one used that system. It makes sense now if you think about the swinging of the camera from any tilt in the aircraft. 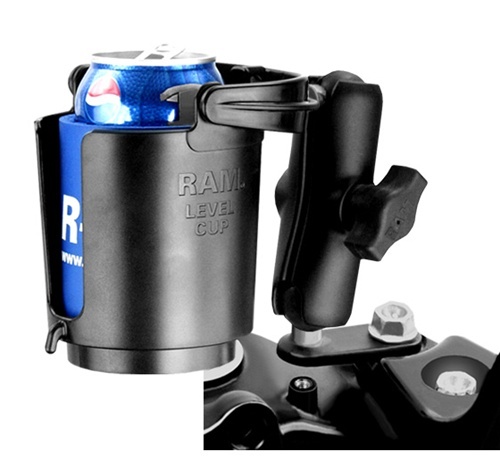 I have thought about trying a motorcycle cup holder, the tension is adjustable but I'm not sure if it could be fine-tuned enough for a camera mount. I have played with one a bit, if anything it could be set to level out slowly so it wouldn't be just randomly swinging around in the wind..might work on a larger slow flying airplane..maybe. This would not work. Gravity may be constant, but it can be temporarily canceled out by centrifugal force. Anything that pivots freely will be all over the place following that force. Unless the plane was flying straight and level the 'bottom' of the camera will face opposite the direction of flight be in up, down or sideways. A simple gyroscope is more likely to work - a motor rotating a perfectly balanced out disc- or better yet wheel-shaped rotor giving a suitably high moment of inertia, hung in an balanced, uncontrolled gimbal. As long as nothing mechanically interferes with the gimbal, it should keep its preset angle with respect to the horizon for as long as the motor keeps running. Downside is of course weight and potential bulkiness. And if the rotating system isn't really perfectly balanced out, massive vibration = blurry footage. The electronic versions advantages are huge though, as they are both likely to be far lighter and give the possibility to adjust the reference direction while flying via radio control.